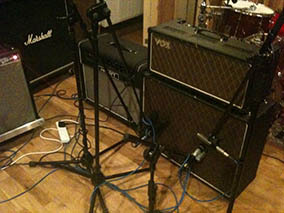 Top quality equipment and great sounding rooms come as standard. But you might often ask: What can you do to make our band recording great? Here are some of the more common questions we get asked. "We need someone to take the reigns, guide performances, address issues and make decisions - but can't afford to hire a studio, engineer AND Producer? " . . . Martin provides Engineering, Production and Musician services as part of the standard studio rate. "We are a guitar band but we think we want extras on our music such as Synths, Piano and electronic elements. But our budget is tight"
. . . Martin is a pro session musician and will offer to perform any extra musician duties you require as part of the standard studio rate. "We have been disappointed with drum sounds in studios in the past"
. . . We've spent a lot of time and money putting together great house drums, mics and pres and also tuning the drum room. Our drum recording is top drawer. "We think the sound of Real Strings or Orchestra on our music would make it great."
. . . No Problem. Firstly we play in sample strings so you get an idea of what the final arrangement will be. Then we notate those arrangements for real players to read. Finally we arrange a small string section at JAM Studios or for something larger we use MPC Productions and the Prague Symphony Orchestra to remotely record the strings. The result is FTP'd back to the studio and we're ready to mix.
. . . Very common question! Mastering is the final process before CD duplication or digital distribution (iTunes). Its the sequencing and balancing of whole songs as a compilation. The material can be enhanced & optimised too but beware: It is NOT a panacea for badly recorded/mixed music! 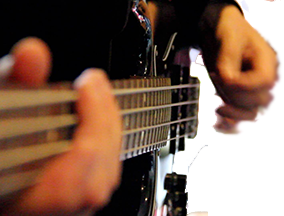 There are many young and inexperienced studios in Ireland who will happily record your band. But very few of them will have a music producer record your music with the experience of Martin Quinn at JAM studios. He has amassed over 18 years experience in music production, musicianship and sound engineering. When it comes to mixing your project Martin prides himself on extreme attention to detail and an obsessive desire to make a mix as good as it can be. As you would expect, we have a wonderful collection of microphones and high class preamps, world class Analog to Digital converters and a fine sounding room to achieve professional drum sounds. At your disposal is a collection of top class electric guitars ( including a Rickenbacker, Fender Strat Delux, Gretsh Tenessee Rose, Epiphone 335 and2 USA Teles) and amps (including Fender Twin, Fender Blues DeVille, Marshall JMP-1/9200 head with 2 4X12 cabs) as well as many top of the line acoustic instruments.